Nikon’s D3100 is the company’s latest entry-level DSLR. 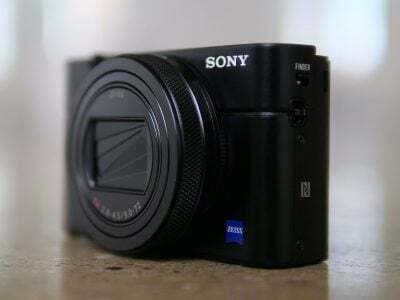 Announced in August 2010, it’s the successor the best-selling D3000 and makes several key upgrades to that model. Most notably the new D3100 now features Live View and video recording facilities – indeed it becomes the first Nikon DSLR (hotly followed by the D7000) to offer 1080p video recording in addition to 720p. To satisfy market demands, the resolution has also received boost from 10 to 14 Megapixels and there’s a number of tweaks to the controls and ergonomics. Like the D3000 before it, the D3100 features a Guide mode which asks simple questions about what you’d like to take before setting up the camera appropriately. It’s a great option for beginners which also teaches you about camera settings, and the D3100 builds upon its predecessor by sensibly showing example images before finally asking if you’d like to shoot with the viewfinder or screen, or film movies instead. Live View and movies are the two major new features on the D3100, which were sorely missing on the earlier D3000. Rather than simply lifting the existing capabilities of models like the D90 and D5000 though, the D3100 offers a choice of HD resolutions and frame rates, and a more efficient encoding system which allows longer recording times. Better still, it’s one of the first DSLRs which takes a decent stab at continuous autofocusing while filming, unlike most rivals which effectively become manual focus once you start recording. The screen, viewfinder, main AF system and continuous shooting may be unchanged from its predecessor, and enthusiasts still won’t find exposure bracketing, an optical depth-of-field preview or a built-in AF motor to drive older (non AF-S) lenses, but the new higher resolution CMOS sensor coupled with Live View, HD video with continuous autofocus and an HDMI port, not to mention everything from a guide-based auto mode to full manual means there’s a lot to like about the new D3100. It brings the somewhat dated D3000 bang up-to-date, while trumping most rivals in this category. Indeed while many entry-level DSLRs attempt to hit the lowest price point, Nikon’s applied its mid-range and semi-pro strategy here of offering a step-up in features for a slightly higher price. As such, the D3100 is more expensive than many rivals and to cover itself it at the budget end, the earlier D3000 will continue to sell while stocks last. But the D3100’s price and feature-set clearly proves that Nikon is trying to tempt new buyers into spending a little more than they may have originally intended. It’s a strategy that worked a treat for the D90 and D300s before it – and looks set to make the new D7000 another best-seller – but will it work for entry-level buyers with often stricter budgets? Find out in our Nikon D3100 review where we’ll compare its features and quality against key rivals and answer the question of whether it’s worth spending the extra. We tested a final production Nikon D3100 running Firmware versions A 1.00, B 1.00 and L 1.002. Following our convention of using default factory and best quality settings to test cameras unless otherwise stated, the D3100 was set to its best quality Large Fine JPEG mode with Auto White Balance and the default Standard Picture Control, with Noise Reduction and Active D-Lighting switched on (both the default settings on the D3100); note Active D-Lighting was disabled for our High ISO Noise tests.